Complete set of 20 woodcuts. Watermarks ‘scales’, ‘high crown’, and two ‘bull’s heads’. Woodcuts c. 297 x 209 mm, bookblock (support sheets) 380 x 280 mm. The Marienleben is the most extensive woodcut sequence in Dürer’s trilogy further comprising the Apocalypse and the Large Passion. With its slightly smaller format, graceful Renaissance architecture, and vivid narrative, this is the most elegant of Dürer’s ‘Three Large Books’. Most of the plates of the Life of the Virgin date from the years 1502-1505, only the final two plates and the title woodcut were added in 1510-1511. The copy at hand is a rare and beautifully homogenous set of fine early impressions. As with the two other books, impressions from individual blocks were printed and sold as the blocks were completed, in some cases many years before publication of the book. These early impressions, before the text was added on the reverse, are the rarest and most sought after, as the woodblocks are at their sharpest, before any cracking or damage affected the integrity of the image. The complete book was finally published in 1511 with Latin text by the monk Benedictus Chelidonius from Nuremberg. 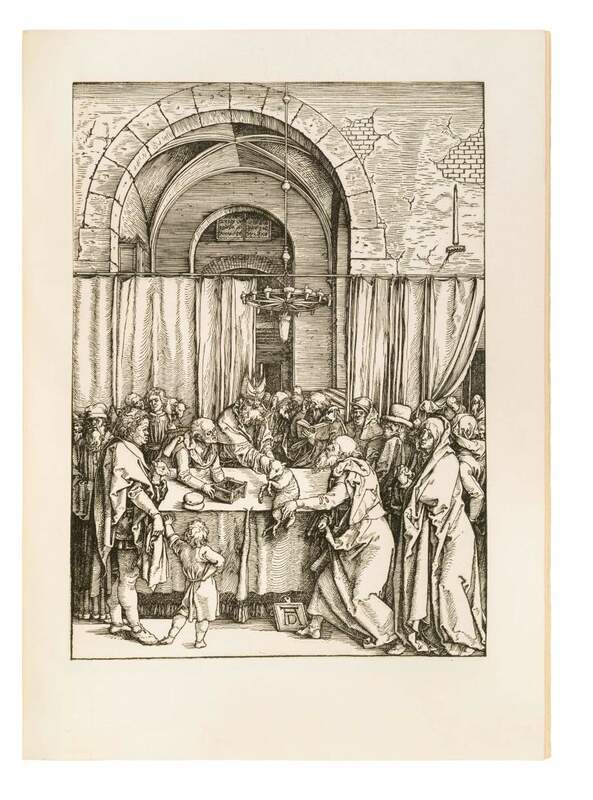 Dürer dedicated the work to Caritas Pirckheimer, the learned abbess of the convent of St. Clara in Nuremberg and sister of his great friend Willibald. The book was likely primarily intended for erudite women in religious houses.